Totes are great for carrying sewing notions, books, craft supplies and other miscellaneous. This tote pattern will help you in making a bag with handles that can be easily personalized by adding ruffles in your choice of colors and prints. The bag is made out of durable canvas then once the bag is finished the ruffles are sewn on. 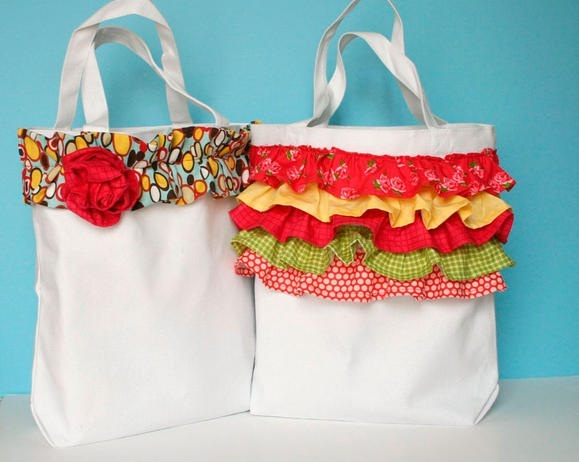 Get creative by making a tote bag with ruffles in school colors and prints of team names or beach balls and sunglasses for a great tote for the beach. This sewing pattern with photos doesn't miss a single step in sewing a sturdy and attractive tote bag.